An extended 5km (3.1 miles) no-fly zone for drones has come into force around airports in the UK after reported sightings at Gatwick, Heathrow and Dublin airports in recent months grounded hundreds of flights and left thousands stranded. Previously, only a 1km (0.6 mile) exclusion zone was in place. But despite the negative reputation they have received, the use of drones isn’t all bad. From finding missing people to delivering takeaways, here are some of the ways the unmanned aircraft can be beneficial. A Norfolk man who went missing in June last year was only found when a police drone spotted him stuck on a marsh. Peter Pugh, 75, was walking home through Titchwell Marshes when the tide came in. He said he attempted to swim to the next field, but was blocked by dense reed beds. Twenty-two hours after he went missing, a police drone recorded footage of Mr Pugh. He was up to his armpits in water. Police said they would have not been able to find him so quickly without the drone, as a helicopter would not have been able to fly so low to the ground. Drones equipped with thermal imaging cameras have also been used by police to find missing people in the US. And in Australia, lifeguards carried out the first at-sea rescue by drone in January last year. The aircraft took just 70 seconds to reach two stranded swimmers, before dropping floats for them to hold onto. It was estimated lifeguards would have taken around six minutes to travel to the pair. Australia has pioneered the use of drone technology to track great white sharks and monitor the threat they pose to beachgoers. The aircraft provides a live video-feed to an operator, who then uses special software, with more accuracy than the human eye, to identify sharks. 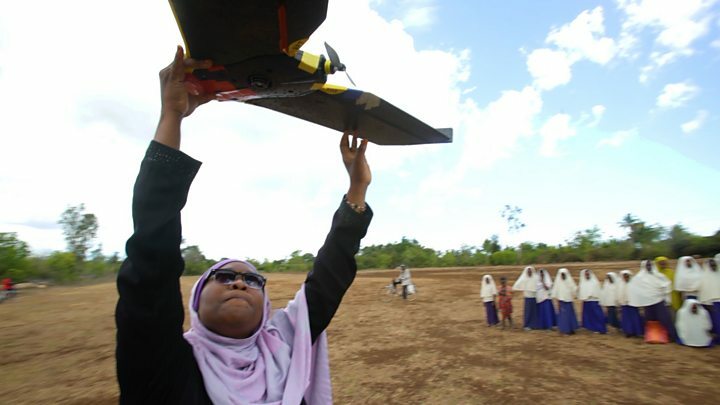 A lack of precise maps in Tanzania presents a significant problem for both the local population and disaster agencies. Satellite imagery is often not good enough to map areas accurately, Edward Anderson, who looks after urban planning and disaster reduction in Tanzania for the World Bank, told the BBC. Meanwhile, aeroplanes are expensive, and impractical in areas that are rapidly changing. “Just mobilising the plane can be hundreds of thousands of dollars,” Mr Anderson said. It is hoped that using relatively inexpensive drones will help local authorities plan vital infrastructure, including roads, pavements, hospitals and schools. In 2016 the government said it was working with retail giant Amazon to bring delivery drones to British skies. The scheme is still in development. “But they will be on a very limited basis as the industry begins to build up the evidence,” he said. “And then I think we could expect to see some of these operations more widespread within the UK within a couple of years or so,” he continued. Drones are already being used to transport takeaways in Shanghai, where food delivery service Ele.me uses the technology to reduce its operating costs. 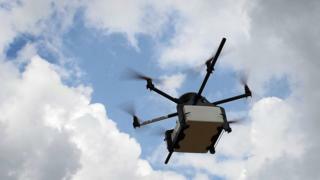 In Rwanda, unmanned aircraft are being used to transport more important cargo: blood and medical supplies. Doctors in rural areas make an order by text message, then drones carrying the supplies are catapulted into the air. They travel at 80mph, releasing their delivery when they reach their destination. Farmers who use drones to spray their crops with pesticide claim they are significantly reducing their use of the chemicals, which can threaten biodiversity. In theory, using drones to spray crops improves the precision with which pesticides are applied because they are able to distribute them in specific volumes on GPS-defined routes through a field. A French farming co-operative called Ocealia has said it saw an average 10% increase in crop yields after it started using the technology. In Indonesia, drones are being used as a cost-effective way of monitoring the dwindling orangutan population. Previously, the great apes’ nests had to be tracked by teams using binoculars. Drones have also have been used in the country to map the health of forests, showing where illegal logging is taking place.